In late February, Jolyn Robichaux, former president of the historic South Side company Baldwin Ice Cream, passed away at 88 years old. Born and raised in Cairo, Illinois, Jolyn Robichaux studied at both Fisk University and Chicago State University before getting hired at the National Labor Relations Board. Around that time, she met Joseph Robichaux, whom she married in 1952. Joseph Robichaux worked under then-Mayor Richard Daley and served as the 21st Ward Democratic committeeman and a Cook County jury commissioner. During this time, Jolyn became the first Black employee of Betty Crocker, and is also said to have been the first Black woman to do product demonstrations for the company. She would go on to become the president of Baldwin Ice Cream, a Black-owned ice cream parlor chain on the South Side. Originally named Seven Links Ice Cream, Baldwin Ice Cream was opened in 1921 by seven postal workers at 53rd and State. According to Robichaux herself in a 1991 interview with the Tribune, the lines to get into the store would snake around the block, mainly because the servers wouldn’t weigh each serving and would just serve as much as the cone could hold. The company eventually changed its name to Service Links Ice Cream Company and expanded to seven locations across the South Side during the 1940s, before being bought out and renamed in 1946 by one of the seven original founders, Kit Baldwin. Baldwin began selling the company’s ice cream in local grocery stores, and Baldwin Ice Cream eventually became a staple of Black owned grocery stores and family dinner tables across the South Side. Cheryl Rodgers, who was born and raised in Hyde Park, remembers visiting the Baldwin Ice Cream parlor in the sixties. She would walk into the small store on 49th and Cottage Grove, the bell chiming above her, and order a huge hand-packed cone. Rodgers also frequented the parlor on 46th and Indiana, where every Friday night she would order chocolate and vanilla in a cone. Her grandfather, whose favorite flavor was black walnut, ordered ice cream by the gallon, which came hand-packed in a little white box. After Baldwin passed away in 1961, as well as the two following company presidents in quick succession, Robichaux and her husband purchased the company in 1967. But when Joseph Robichaux suddenly died of leukemia in 1971, Jolyn decided to sit at the helm of the company herself, and notified Baldwin’s largest account holders accordingly. She had no formal business training, but she was forced to learn quickly: Baldwin’s eight parlors were losing business as people began moving out of the South Side. Using her infallible charm and quick business sense, Robichaux not only improved the company’s delivery and accounting services but also tripled its annual profits. Robichaux and the company also broke “the freezer barrier” and got Baldwin Ice Cream’s products to be sold in large supermarket chains all across the United States. Jolyn also appointed several Black women, including her sister, mother, and niece, to executive positions in the company. 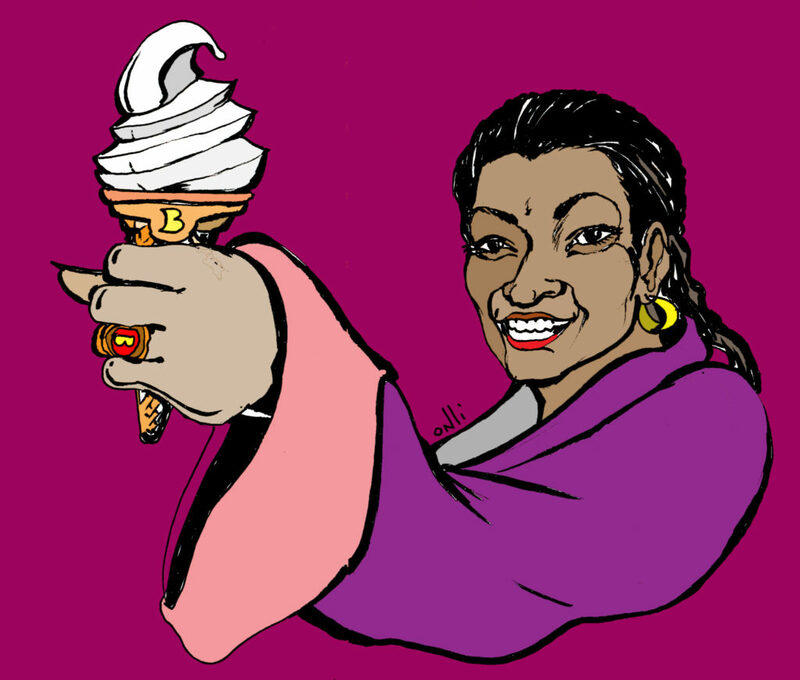 According to a 1991 Tribune interview with Robichaux, being the only Black ice cream manufacturer in the United States allowed her to leave a strong business impression. The longevity of the Baldwin franchise was a profound inspiration for Powell and her own business aspirations. Born in South Shore, later raised in Hyde Park, and an alumna of Florida A&M University, Powell used both her passion for cold desserts and her sharp business acumen to raise Zberry from the ground up. While things are still up in the air for Zberry, Powell mentions an array of possibilities for the future of the store, including moving locations, going mobile, or trying to get Zberry’s products in grocery stores. Perhaps Powell finds some of Robichaux’s own tenacity in herself. Although Baldwin’s parlors have long since disappeared, and the company discontinued the ice cream in 2014, Robichaux’s legacy as a powerful Black businesswoman and the memories of Baldwin Ice Cream remain as testaments to the South Side’s long history of culinary entrepreneurship. In 1985, Robichaux was awarded the “National Minority Entrepreneur of the Year” award from then-Vice President George H.W. Bush. By 1991, only one original Baldwin neighborhood parlor remained, in Chatham. In 1992, Jolyn retired, moved to Paris, and sold the company to Eric Johnson, whose father founded Johnson Products, and who renamed the company Baldwin Richardson Foods. According to Robichaux’s niece, one of the few things Jolyn wasn’t able to accomplish during her presidency was the success of a black-eyed-pea-and-brandy ice cream. For Yahya Muhammad, owner of Shawn Michelle’s Old Fashioned Homemade Ice Cream, ice cream has always been a prominent culinary staple of his community, current and past. He still can’t forget the unique flavor of Baldwin’s homemade ice cream—one that he says you can only ask your grandma to make, the kind you make with a churn. Keeping these memories in his mind as he pursued his master’s degree, Muhammad decided to experiment with homemade ice cream himself, spending five years perfecting his recipes. He initially sold his ice cream to friends and family before opening his first Shawn Michelle’s store at 119th and Western almost a decade ago. Muhammad describes his ice cream selection as “old-fashioned flavors with an upscale twist,” with unique flavors like “raspberry cookies & cream” and honey-cinnamon-graham-cracker. Shawn Michelle’s recently moved to the historic, recently reopened Rosenwald Courts Apartments in Bronzeville, which offers more square footage, booths, and tables, and will be opening in July. As Black entrepreneurs, both Muhammad and Robichaux built their businesses around the goal of uplifting the Black communities around them. Muhammad also recalls visiting Baldwin Ice Cream parlors as a child, and salutes Baldwin’s, and Robichaux, for paving the way. Ultimately, the legacy of Baldwin Ice Cream, and Jolyn Robichaux, lies not only in memory but also in the local Black-owned businesses that continue to sustain and honor the South Side’s history of Black entrepreneurship. It is these Black restaurateurs in particular who, through their food and their spaces, foster a sense of community, culture, and pride that promises to remain and prosper. very informative, i remember eating baldwin ice cream as a child, new york vanilla was my favorite. it was a special treat for my family and friends. The Baldwin Ice cream I knew in 1956 was open and operated by Mr. and Mrs. Baldwin was located under the 51st EL station. Because my aunt would take me after church on Sunday at Berean Baptist Church. I was under the impression that their son joined the NMSDC and became a Corporate Plus business. Going to Baldwin’s after Sunday dinner was a tradition in my family. Their chocolate ice cream was the best! When I left Chicago at age 16, Baldwin’s was the first and most dearly missed establishment of all!